Problem Description The disease appears at flowering stage with the formation of yellowish, circular pycnidia and aecia singly or in small groups on leaflets and pods. 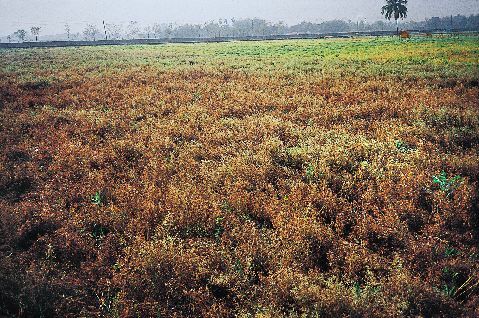 The disease appears at flowering stage with the formation of yellowish, circular pycnidia and aecia singly or in small groups on leaflets and pods. Later on there is formation of oval to circular, brown uredial pustules measuring up to 1mm on leaflets, branches, stem and pods which coalesce to form larger pustules. The dark brown to black elongated telia is formed mainly on branches and stems late in the season. In severe form, plants dry up and killed, resulting in no seeds formation or seed remain small and shriveled.